To celebrate the release of Commander, today will see structured and casual play with card giveaways & spot prizes. More info to follow on game schedules for the day, but please register below if you are attending. Definetly intrested, got a few of the same lads as were with me last time intrested as well but there not sure on being free then yet. The deck itself contains 51 unique cards (ie they dont belong to any set and this is the only way to get them) and 3 over sized Commander cards. These cards are to be used only in commander games but their smaller counterparts (which are included in the deck) can be used in any casual game. As for the Commanders themselves its very straight forward. They have a casting cost like anything else and when they are on the table the have effects and stats just like any creature and can be killed as such. The games on the day will entail players paying a set fee and receiving a Commander deck, then everyone is paired up into groups of four and play off. Aside from the presence of the Commander cards it works pretty much like a normal 4 player game. Depending on numbers we will see where we will go from there. Hope to see a good turn out on the day, as usual theres lots of fun to be had and prizes to be won so come on down and support Magic at your local* club! 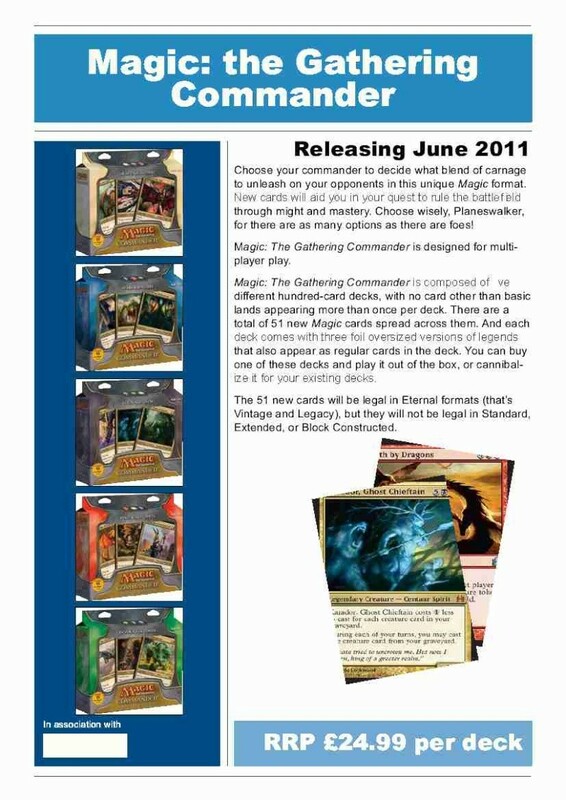 Bit of an update for MTG:Commander. So having finally got my grubby paws on a couple of the Commander sets I can genuinely say im not surprised. As with the Arch Enemy set it seems a pretty straight forward format in that you : Play with 2-4 players, start with 40 life and have ridiculously big cards. Unlike the Arch Enemy decks however, the cards received in the Commander set are stupidly good. If you never intend to play a multi player game of magic in your life, it matters not! The cards are well worth it on their own. As for the Commanders themselves, well you get a choice of 3 and after choosing your one-of-three you place in your 'Command zone'. In this 'Command Zone' he will remain until you play your casting cost and et voila he appears on the table as a creature in his small, ordinarily sized card form. From here his/her amazing abilities will manifest in a variety of cool and painful ways. Things of note about the Commander. He can DIE! Sooooo be careful. However to counteract this you have the option to place him back in his 'Command Zone' at any time. If (heaven forbid) your Commander should suffer something nasty, such as being returned to your hand, merely use the ordinary card sized version and do just that. After all apart from 1 or 2 trick he behaves just like a creature spell. Probably the two most important factors of your Commander are that A: He defines your deck. This means that for example, your Commander requires Green, White and Black mana to be summoned, those are the only colours allowed in your deck. Any lands that produce a different type of mana from that required by your Commander are hence forth colourless. And B: The Commander only needs to deal 21 points of damage to kill a player. This is pretty cool and obviously means regaining health is pointless if you are going to receive 21 points from a Commander creature, which should always be kept in mind as that 40 health you start on might make you feel a little too complacent. So to sum up, this Saturday I personally (cuz im great) will be demoing Commander for all those who wish to see and perhaps even to some of those who dont. After everyone has had a feel for the game we may just well arrange a competitive day a couple of weeks after Q-Con. But still, come on Saturday, get a feel for the game and perhaps get a couple of freebies!